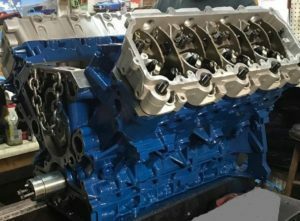 6.0 Powerstroke re-manufactured engines with available upgrades - Asheville Engine, Inc. I have a customer that has f550 trash truck, that has replaced the engine with a Reba reman. The engine has blown up once, and was replaced under warranty by Reba. The replacement engine ran for 2 months then it got fuel in the water, his mechanic found the problem to be a cracked cylinder head. This time the engines warranty has ran out, so got 2 new heads, and replaced them. Now he has 6 months on the engine. He is seeing some main/rod bearing material in the oil filters. He is tried wasting money on the truck, but I mentioned your add to him, and he’s thinking hard about it. Do you have any input that should give him, that I can’t get from your engine site.